This first concert of 2019 both draws on Carnegie Hill Concerts’ history and looks toward the future. The Carnegie Hill Concerts Chamber Players will present works by some of the outstanding composers whose compositions have been featured in previous seasons. 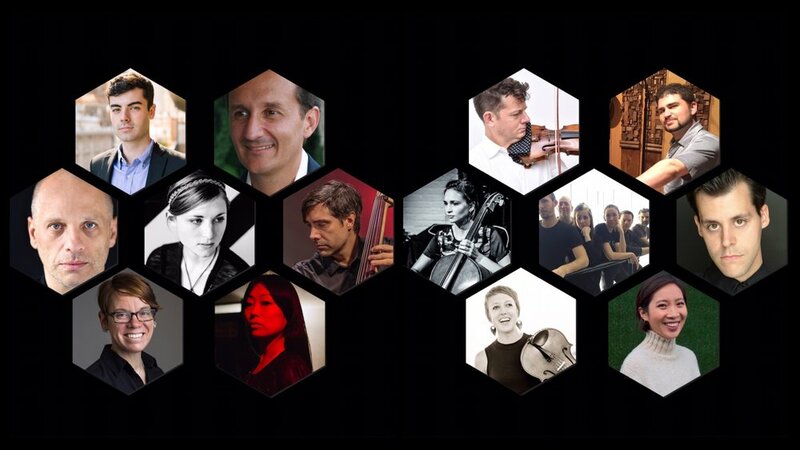 And all donations will go to funding the remainder of this season, during which each concert will focus on works by a single living composers not yet highlighted in the series. Alex Cohen has emerged as a prolific educator and drummer in the New York City music scene, working with artist as diverse as Mac Miller, death metal legends Malignancy and Pyrexia, and National Geographic. Alex's endeavors have taken him all over the world, and he's also a featured educator in writer for Sick Drummer and Drumhead Magazines, as well as being an endorser for Paiste Cymbals, Trick Pedals, and Los Cabos Drumsticks. The Bang Group, a New York-based, rhythm-driven, contemporary dance troupe is directed by Jeffrey Kazin and choreographer David Parker. TBG tours and performs widely throughout the United States and Europe as well as in regular seasons in New York City presented by Danspace Project, New York Live Arts (and its predecessor Dance Theater Workshop,) Dance Now NYC, Harkness Dance Festival, and The 92nd Street Y, among others. Parker is a 2013 Guggenheim Fellow in choreography whose work straddles percussive and contemporary forms. Pauline Kim Harris' "Sparkle" is the first pure music piece the company has had written for them and composed expressly for their pointe and tap shod feet. Stephen Gosling earned his Bachelor’s, Master’s and Doctoral degrees at Juilliard, where he was awarded the Mennin Prize and Sony Elevated Standards Fellowship. He is a member of New York New Music Ensemble and Talea Ensemble, as well as a pianist at New York City Ballet. He has also performed with the New York Philharmonic (most notably as soloist in Messiaen’s Sept Haikaï), Chamber Music Society of Lincoln Center, Orpheus, Orchestra of St. Luke’s, St. Paul Chamber Orchestra, Eighth Blackbird, American Composers Orchestra and Chamber Orchestra of Europe, among many others. Ling Ling Huang started violin at the age of 4 with her mother Lilan Z. Huang. She continued studying violin with Fredell Lack until her admission to the Cleveland Institute of Music at the age of 15. There, she won the concerto competition with Stravinsky Violin Concerto and the Milhaud Prize. Most recently, Ms. Huang performed the Britten Violin Concerto with the Shepherd School Symphony as a result of winning the Concerto Competition at Rice University’s Shepherd School of Music where she received an Artist Diploma with Paul Kantor. Ms. Huang currently lives in New York, freelancing and playing as a substitute violinist in ensembles including the New York Philharmonic, the Houston Symphony, and the Houston Grand Opera. In her free time, she enjoys writing on her website. Kallie Ciechomski performs regularly with International Contemporary Ensemble, New York City Ballet, Pittsburgh Symphony, New Jersey Symphony, New York City Opera, Talea Ensemble; and at Lion King and Dear Evan Hansen on Broadway. She has also appeared with Ben Folds, Norah Jones, Ray Lamontagne, Snarky Puppy, Andrea Bocelli, and Stevie Wonder. Feminist Counterpoint, Kallie’s solo project, champions music written in her lifetime by women, trans, and nonbinary composers. Through this project, she amplifies underrepresented voices by commissioning new works, reinforcing the existing repertoire, and reaching new audiences through lecture/recital style installations in nontraditional venues. Concerts have included a sold out performance at New Music Gathering, amplified recital in Times Square, concert/workshop at Girls Rock Camp, and two week West Coast tour. This year, she is focusing on new works for viola, electronics and projections with shows at Areté Gallery and Symphony Space. Kallie’s 2018-2019 season includes recitals and masterclasses as guest artist of the Arthur Russell Festival for Creative Music Making, performances of traditional Cuban music as guest violist of Toomai Quintet, touring with Gyda Valtysdottir, and the release of Forrest Pierce’s string trio for New Focus Recordings. Violinist Conrad Harris has performed at Ostrava Days, Darmstadt Ferrienkürse für Neue Musik, Gulbenkian Encounters of New Music, Radio France, Warsaw Autumn, and NY Sonic Boom Festival. He is member of the FLUX Quartet and violin duo String Noise, concertmaster/soloist with the S.E.M. Orchestra, Ostravská Banda, STX Ensemble, Wordless Music Orchestra and Ensemble LPR. He has performed and recorded with Elliott Sharp, Robert Ashley, Alvin Lucier, David Behrman, "Blue" Gene Tyranny, Jean-Claude Risset, Rohan de Saram and Tiny Tim. A recording of the sonatas of Lejaren Hiller was released in 2018 with pianist Joe Kubera on New World Records. Harris has also recorded for Lovely, Mode, Asphodel, Vandenburg, CRI, Northern Spy, and Vinyl Retentive Records. “Trailblazing” cellist Mariel Roberts (Feast of Music) is widely recognized as a deeply dedicated interpreter of contemporary music. Recent performances have garnered praise for her “technical flair and exquisite sensitivity” (American Composers Forum), as well as her ability to “couple youthful vision with startling maturity”. (InDigest Magazine). Roberts' work emphasizes expanding the technical and expressive possibilities of her instrument through close relationships with innovative performers and composers of her generation. Her passion for collaboration and experimentation has led her to premiere hundreds of new works by both emerging and established artists. Roberts has appeared as a soloist and chamber musician across four continents, most notably as a member of the Mivos Quartet, Wet Ink Ensemble, International Contemporary Ensemble, and Ensemble Signal. She performs regularly on major stages for new music such as the Lincoln Center Festival (NYC), Wien Modern (Austria), Lucerne Festival(Switzerland), Cervantino Festival (Mexico), Klang Festival (Denmark), Shanghai New Music Week (China), Darmstadt Internationalen Ferienkurse für Neue Musik (Germany), and Aldeburgh Music Festival (UK). Roberts has been featured as a chamber musician on recordings for Innova, Albany Records, New World Records, New Amsterdam, Carrier Records, New Focus, and Urtext Records. Paula Matthusen is a composer who writes both electroacoustic and acoustic music and realizes sound installations. She has written for diverse instrumentations, such as “run-on sentence of the pavement” for piano, ping-pong balls, and electronics, which Alex Ross of The New Yorker noted as being “entrancing”. Her work often considers discrepancies in musical space—real, imagined, and remembered. Awards include the Walter Hinrichsen Award from the American Academy of Arts and Letters, a Fulbright Grant, two ASCAP Morton Gould Young Composers’ Awards, and the 2014 - 2015 Elliott Carter Rome Prize. Matthusen is currently Associate Professor of Music at Wesleyan University and Chair of the Music Department. between the smell of dust and moonlight is a multi-movement work that engages with the idea of the gradual evolution of space and the multiple roles it may serve. Written specifically for the Philips Collection and commissioned by the Metropolis Ensemble, the piece created different sites of musical activity that drew on the Phillips Collection's present incarnation as renowned art museum as well as the traces of its domestic past, as evidenced by it unique doorways and fireplaces. The second movement of this work, the violin trio, was one such site marking musical activity within this work. The title is drawn from Don Hertzfeldt's film It's Such a Beautiful Day. David Lang is one of the most highly esteemed and performed American composers writing today. His works have been performed around the world in most of the great concert halls. Lang’s score for Paolo Sorrentino’s film Youth received Academy Award and Golden Globe nominations, among others. Other recent work includes man made, a concerto for So Percussion and orchestra, co-commissioned by the Los Angeles Philharmonic and the BBC Symphony; his opera anatomy theater, written in collaboration with visual artist Mark Dion, at Los Angeles Opera; the public domain, a commission from Lincoln Center for 1000 amateur singers; and his opera the loser, based on the novel by Thomas Bernhard, which opened the 2016 Next Wave Festival at the Brooklyn Academy of Music, and for which Lang served as librettist, composer, and stage director. His opera prisoner of the state, co-commissioned by the New York Philharmonic, Rotterdam's de Doelen Concert Hall, London’s Barbican Centre, Barcelona’s l’Auditori, Bochum Symphony Orchestra, and Bruges’s Concertgebouw, will premiere June 6-8, 2019 in New York, conducted by Jaap van Zweden. Lang is a Professor of Music Composition at the Yale School of Music and is Artist in Residence at the Institute for Advanced Study in Princeton. He is co-founder and co-artistic director of New York's legendary music collective Bang on a Can. His music is published by Red Poppy Music (ASCAP) and is distributed worldwide by G. Schirmer, Inc.
For violin and piano. "An illumination round is a type of bullet that was used extensively in Vietnam. This bullet, when fired, leaves a phosphorus trail hanging in the air, allowing machine gunners in helicopter gunships to aim more precisely. In my composition, the relationship between "bullet" and "shadow" has defined the roles of the violin and piano: the instruments trade off being either image or echo. In this way, a fierce counterpoint devolves from what are really just unison ideas." Pauline Kim Harris is a violinist and composer, prolific in the classical to the experimental/avant-garde. A frequent guest with New York City’s leading new music ensembles, she has also toured internationally with the Orpheus Chamber Orchestra. Pauline serves as Music Director of the Bill T. Jones/Arnie Zane Dance Company and has performed as violin soloist for choreographer Pam Tanowitz and David Parker of The Bang Group. As a curator, she co-produced Drawing Sounds II, with husband, Conrad Harris at the Drawing Center, Petr Kotik @75 at (le) poisson rouge and continues as co-curator of Carnegie Hill Concerts, a chamber music series committed to new music. Her violin duo, String Noise released their freshman album “The Book of Strange Positions” on Northern Spy Records in 2015 and can also be heard on Dymaxion Groove Records, Cold Blue Music and more. Pauline has discovered an equal passion for composing as performing and is thrilled to be a resident fellow this spring at the Atlantic Center for the Arts. Commissioned by the St. George’s Choral Society her piece for organ, choir, cello and soprano, “When We Were” was premiered in 2016. She is currently making a new work for String Noise and Syrinx (acoustic synthesizer) "100 Thimbles in a Box" to be premiered on the Interpretations Series at Roulette on June 6, which will also include new works for String Noise by Sam Yulsman, Jessie Cox and George Lewis. A collection of even more new works will be presented July 9-13 on her first residency at The Stone and look out for her debut solo album on Sono Luminus Label later this summer. Fun fact: Pauline was in the final masterclass of Jascha Heifetz. Kim Harris first started thinking about tap and pointe shoes as instruments after being introduced to David Parker's percussive dance company, The Bang Group. In works by Steve Reich and Morton Feldman, the dancers take the role of musicians and play the score. In a piece by Dean Rosenthal, a violinist plays the score along with 3 dancers like chamber music. "Sparkle" is the first purely musical piece the company has had written for them, composed expressly for pointe and tap. Traditionally, the pointe shoe is not meant to be heard. In Sparkle, a single pair of pointe shoes determines the preliminary sound of the entire piece into which all others join, creating a multi-textural soundscape. In composing this work, a 12-tone scale for tap shoes and a 7-tone scale for pointe shoes were created. Through rhythmic variation, repetition, dynamics and canons, the piece unfolds in an abstract and provacative way, ending unexpectedly and emotionally. Sparkle is dedicated to David Parker's 60th Birthday. Composer, conductor and pianist Richard Carrick is a Guggenheim Fellow who writes music of spatial depth and robust stasis, described as "charming, with exoticism and sheer infectiousness" by The New York Times. His music has been programmed and presented internationally at festivals including NYPHIL Biennial, ISCM World Music Days, Enescu Festival, by JACK Quartet, Tony Arnold and others, released on three critically acclaimed CD’s, and published by PSNY. Carrick is Chair of Composition at Berklee and co-founder of Either/Or, winner of the CMA/ASCAP Award for Adventuresome Programming. He has presented master classes and lectures throughout Europe, Israel, Rwanda, Japan and South Korea. Born in Paris of French-Algerian and British descent, Carrick received his BA from Columbia University, PhD from the University of California-San Diego with Brian Ferneyhough, and pursued further studies at IRCAM and the Koninklijk Conservatorium in The Hague. Natural Duo begins with from a bizarre arrangement of the opening idea of the second section of my Natural Behaviour for solo percussion. A phosphene is a phenomenon characterized by the experience of seeing light without light actually entering the eye. The word phosphene comes from the Greek words phos (light) and phainein (to show). Composer and bassist James Ilgenfritz, recognized in the New Yorker for his “characteristic magnanimity” and his “invaluable contributions to New York’s new-music community as a composer, improviser, collaborator, and organizer,” leads The Anagram Ensemble and performs regularly as a solo bassist. His trio Hypercolor (with Lukas Ligeti & Eyal Maoz) recently released their debut CD on John Zorn’s label Tzadik. James’s 2017 solo CD Origami Cosmos features works by Annie Gosfield, Miya Masaoka, Elliott Sharp, & JG Thirlwell, and his international jazz quartet MiND GAMeS released their second CD Ephemera Obscura on the Portuguese label Clean Feed in July 2017. In June 2018 James presented his second residency at John Zorn’s venue The Stone, now located at the New School’s Black Box Theater, featuring world premieres of Ilgenfritz compositions for the Momenta Quartet, flutist Margaret Lancaster, The New Thread Saxophone Quartet, and the Kathleen Supove/James Moore/Jennifer Choi trio, as well as works for solo contrabass by John King, Anthony Donofrio, and Lucie Vitkova. James has performed throughout the US, Canada, the Czech Republic, Germany, Hungary, Indonesia, Italy, Poland, and Switzerland. James’s notable performances include work with composer/improvisers Pauline Oliveros, Roscoe Mitchell, Rufus Reid, Anthony Braxton, “Blue” Gene Tyranny, and many others. James has received grants from New Music USA and American Composers Forum. He holds a BA in Music Performance from University of Michigan and MA in Contemporary Music Performance from UCSD, and directs the Suzuki bass program at Brooklyn Conservatory of Music. The Roman poet Ovid described how dripping water hollows out stone, not through force but through persistence. Terminal Affirmative (2014) is a dialog between conceptuality and musicality, as the expansive melodic potential of the violin stands in stark contrast to the tightly focused expressive range of the double-pedal bass drum. Both parts are extremely virtuosic, but while the violinist's hands and fingers are very active, the hands of the percussionist are kept motionless, with all the force and persistence transferred to the percussionist's two feet. This redirected energy draws into sharp focus the persistence of repeating an action so many times that a permanent impression is driven into stone. Molly Joyce’s music has been described as one of “serene power” (New York Times), written to “superb effect” (The Wire), and “impassioned” (The Washington Post). Her works have been commissioned by ensembles including the New World, New York Youth, Pittsburgh, and Milwaukee Symphony Orchestras, and New Juilliard, Decoda, and Contemporaneous ensembles. Additionally, her work has been presented at TEDxMidAtlantic, Bang on a Can Marathon, Classical:NEXT, VisionIntoArt’s FERUS Festival, and featured in Pitchfork, WNYC’s New Sounds, Q2 Music, I Care If You Listen, and The Log Journal. Molly has studied at The Juilliard School, Royal Conservatory in The Hague, and Yale School of Music. Written in the winter of 2015 in The Hague, Netherlands, Shapeshifter is motivated by the concept of control and losing it. Composed for the duo of violinist Monica Germino and sound engineer Frank van der Weij, I was very intrigued that typically Frank is not seen visually, and therefore wanted to play with the idea of him controlling Monica’s sound and gradually letting go of that control. In addition, I wanted Monica to in her own way lose control of her playing and gradually “shapeshift” to a new and divergent sound. Shapeshifter is also dedicated to the duo of Monica Germino and Frank van der Weij, who premiered it in April 2015 at Korzo Theater in The Hague, Netherlands. I have always admired them both from afar, and to write and work with them is truly a dream come true. Will Healy is a composer and pianist based in New York. Noted for his "lushly bluesy" sound and "adroitly blended... textures" (New York Times), he is the artistic director of ShoutHouse, a collective of hip-hop, jazz, and classical musicians. After playing trumpet in an Afrobeat band for a few years, he grew interested in collaborating with performers from many corners of the New York music scene. In addition, he is an accomplished pianist specializing in Bach, with a repertoire that includes the complete Goldberg Variations and WTC Book 1. Healy was the recipient of the Richard Rodgers Scholarship at The Juilliard School, where he studied with John Corigliano, Steven Stucky, and Samuel Adler. He has also studied with Kevin Puts, Harold Meltzer, and Richard Wilson. Recent awards include a 2017 Charles Ives Scholarship from the American Academy of Arts and Letters, an ASCAP Morton Gould Award, the W.K. Rose Fellowship, a JFund commission from the American Composers Forum, and prizes in the Juilliard and Kaleidoscope Orchestra Composition Competitions. He was the recipient of the Aaron Copland Prize from the Bogliasco Foundation in 2018, and has been a fellow at the Aspen Music Festival, Minnesota Orchestra Composers Institute, and the L.A. Phil’s National Composers Intensive. Healy’s work has appeared at The Kennedy Center, Lincoln Center, The Apollo, on the NY Philharmonic’s Biennial series, on "New Sounds" with John Schaefer (WNYC) and "Making Music" (WBAI), and more. He studied piano for many years with Dennis Malone at the Crestwood Music School. Introducing yourself as a “composer" in the 21st century is a strange experience. For people outside of the concert music world, they often ask questions like, “Those still exist?” (we do) or “Aren’t composers dead?” (not all) or “Which instrument do you write for?” (more than one). After decades of declining ticket sales and increasing isolation from general society, it makes sense that people are confused by my occupation. In this atmosphere, what is the future of classical music? Will it be seen as a beautiful, but antiquated art form, something that should be preserved like a painting in a museum? Or will it transform into something new, that remains current and changing, as it has in earlier eras? In “Future Caprices”, I reflect on the future of concert music. I picture sounds that are engaging, beautiful, and challenging, with turns and changes that are as rapid as the world of instant gratification that it will inhabit. The piece is in one movement, divided into sections of mechanical, driving rhythms that contrast with nuanced, lyrical writing. Thank you, and I hope you enjoy the piece.